This thread is for posting your Drama, Storytelling, and/or Music Workshop Lessons and Ideas for the boy Jesus in the Temple. Please format your posts so that they are easy to read. Please include full titles and publisher details for resources. 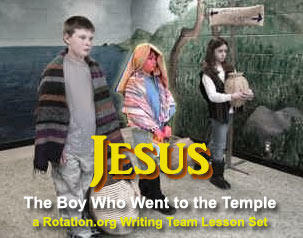 This rotation introduces the students to Jesus as a child like them. Recently we’ve learned that Jesus was a special baby, announced by thousands of angels. We’ve learned that He was a special toddler, visited by Wise Men from the east. Now we’ll learn about Jesus as a child. We don’t know much about his childhood from the Bible, but we know that not only was Jesus fully God and fully human, but he was also fully a KID!! More importantly, we'll teach the idea of Jesus making his religious education a PRIORITY. That's what the story of Jesus in the Temple teaches. He was about his father's business, and perhaps that is the ONLY excuse a child can ever use to disobey their parent. Plenty to discuss there. We'll also learn about Jesus through his brother's eyes. James "the Just" was not an early follower of Jesus, and there's plenty of grist for the mill there! Why? How did he come to believe in Jesus? It seems he became a follower after the Resurrection. Uses a script to tell the story. Choose some simple foods that Jesus would have eaten, some that we still eat, others that we consider more exotic! Zola's lesson was a sugggestion. Neil has added the following storytelling presentation details. James welcomes your students and talks them about his brother. In this 'storytelling' workshop, your kids will be invited into JAMES' house to meet James, Jesus' brother. Who better to tell the story of what Jesus was like in his younger years! Interestingly, James was not an early follower of Jesus. Indeed, it seems he didn't become a believer until the Resurrection! I think this opens up all sorts of interesting storytelling possibilities....James not realizing who his brother was. James being told by Mary and Joseph about the angel, but not wanting to believe it. Why? Because Jesus was his brother! In a traditional 'one week' Sunday school lesson on this story MOST churches would never devote this much effort to constructing James' house. But we in the Workshop Rotation Model BELIEVE in creative spaces, and because we will rotate different grades through that space each week, we can 'afford' the extra effort because we don't have to tear it down next week. 1. Design your workshop space to look like the house of James in Nazareth. You can hang large brown paper "painters" drop cloths to help create the room. Paint a window shutter and some wall lamps/hangings and extra furniture (you're building a set, -an imaginary room). For this workshop, you may want to pick a very small room so as to be able to cover the walls with the paper and paint the scene. If you have a larger room, you can still hang the brown paper from frames, or other dividers. Go big and be creative! 2. His father was a carpenter, so consider some simple wooden tables, and some saws and tools laying around (they don't have to be authentic, the kids will play along). Have a rug to unroll as part of James' "patter" ...because guest shouldn't have to sit on the floor. 3. You'll need a water basin and towel for washing feet. As James honors your students with this ritual, he will explain it, and remember the night Jesus did that same. The pouring of the water can also be a way for James to remember the time Jesus was baptized. James wasn't there but perhaps later he was baptised. 4. At a point in the story, provide some grapes, dates, figs, and bread for your guests. These too can give James something to talk about...how Jesus would eat with anybody, and how the authorities would react to that. 5. Have a floor game that "Jesus might have played", and think about other games that Jesus and James might have played together. James can ask the kids what games they play, and when they say "video", he can pretend not to understand. 6. Have a handdrawn map of Israel (as if it belong to James) marking the cities and road. Put some "X's" where Jesus and James had been. James will talk about all the places they went as children nearby Nazareth. The time their dad took them to see the Sea of Galilee! Discuss what biblical places Jesus would have been able to see from the hilltops: Mt Carmel where Elijah fought th prophets of Baal, Mt Gilboa where Saul and Jonathan were killed. And Jesus could have seen snow on top of Mt Hermon to the north! All these things will help the kids imagine Jesus' life as a boy. At the end of James' presentation, James will discuss being a leader in the early church, telling others about his brother. With older classes, at the end he will remove his cloak, and the teacher will tell the children that James was killed in Jerusalem because he would not renounce his faith. There are others on the web as well. It includes details on the family of Jesus. 1. The children assemble outside the door and knock. James comes out, closing the door behind him, and questioning who the children are. (James was a leader of the church who was killed for being a follower). "You haven't come from the Temple Guard have you?" James quizzes a few of the kids about who they are, who they follow. 2. After he is assured of their credentials. James welcomes the children by having them take off their shoes. He invites them into his humble home, unrolls a large rug for them to sit on. Offers a pillow to the teacher whom he lauds as one who deserves a place of honor. He insists that the girls wear something over their hair, explaining this custom, but the teacher intervenes saying this is no longer done, there is "neither male or female" in Christ, and James agrees. 3. James washes the children's feet (they can ask for their hands to be washed if they choose). James tells them about the ritual, and remembers the time at Jesus' last supper. James talks about the churches he has helped lead in Jerusalem, and has heard of many others being found in Ephesus and Antioch for example. He asks if they have met Paul, for example. What are you doing here? ...this is James' segway into describing life growing up in Nazareth. He gives his biography, and tells a few stories about his brother Jesus. James tells the kids he never thought Jesus was different, even though his mother and father thought so. He only heard the story of the Angel much later. James tells the children about how he came to believe AFTER the resurrection and became a leader in the church. "Perhaps you've read my letter to the Christians? Well I hope you do...here is a summary". 5. James feeds the children. 6. James tells the story of Jesus going to the Temple as a young boy to talk with the teachers, and being left behind by his family. He mentions what Jesus did there, but admits he scoffed at his brother and was glad he got in trouble for disobeying his parents. James asks the children if Jesus was right to do what he did. James should be the devil's advocate: when is it right to disobey one's parents? James may also confess why he didn't become a follower of Jesus. (He was too busy working? He didn't realize who Jesus was? He didn't believe the stories?) Why doesn't a person believe? Give each child a wooden dreidel and show them how to spin it. These can be purchased IN BULK on Amazon.com. James the carpenter's son would have made his out of wood. Give each child a crumpled & rolled bit of brown paper bag (when you crumple it, it gets soft). Have them write what the four Hebrew letters/sides of the dreidel mean and take it home with their dreidel. How do you know that Jesus is the Messiah? Name someone you have shared the story of Jesus with and what you told them. What would you say to your parent if you wanted to go to church but they were too busy? If someone wanted to put you in jail for believing in Jesus, what would you tell them? If you could invited Jesus to play with you, what game would you invite him to play? What would Jesus say to your family if you invited him over for dinner? 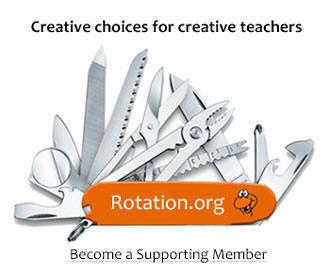 A lesson idea written by rotation.org member Zola. Elaborated by Neil MacQueen. Then we taught "Hava Nagila", a Hebrew folk song, the title meaning "Let us rejoice". Although this is a song written only in the early 20th century, it introduced the children to the Hebrew language and music. After learning that happy song, they learned the Hebrew circle dance (or horah). We got the choreography from Youtube. We had a GREAT time! Parents reported that children were singing and dancing as they were going home. And they even knew its meaning. Find the story of Jesus in the Temple in the Bible. Act out the story of Jesus in the Temple, from the Bible or from the skit provided. Discuss how Jesus was like others, and how he was different. Discuss how we are like others, and how we are different. Identify with Jesus: When Jesus was a child, he learned and grew and developed like we did, guided by his faithful parents and community. Be like Jesus: The children will learn what it means to "grow in stature" both the physical and spiritual meaning of the concept, and consider how they are growing in stature as a child of God. Learn from Jesus: The children will see how their lives are being shaped. The Bible does not record any events of the next 18 years of Jesus’ life, but Jesus undoubtedly was learning and maturing. As the oldest in a large family, he assisted Joseph in his carpentry work. Joseph may have died during this time, leaving Jesus and his brothers to provide for the family. In terms of development, he went through the same progression we do. He grew physically and mentally and spiritually. He related to other people, and he was loved by God. The children should consider how we become whom God wants us to be, the forces and people at work shaping us, and how we can accept or reject such shaping. Story may be acted out from Bible, Bible story book, imaginations, or skit (included in packet – best if used with older children). Opening Prayer: Dear God, We thank you for this time together today. We ask you to be with us as we learn about how you made Jesus like all the other children as he was growing up, and yet still different from the others. Help us discover together how we are alike and different in the ways you created us to be. Amen. You all know the story of when Jesus was born, and I know you know that there’s lots in the Bible about Jesus when he was a grown up, but did you know that there is a little bit in there about when Jesus was a kid like you? There are two major books in the Bible: the Hebrew, or Old Testament, and the New Testament. The Old Testament deals with the history of our faith before the birth of Jesus Christ. The New Testament deals with the history of our faith after the birth of Jesus Christ. Jesus’ story is written down in the first four books of the New Testament, Matthew, Mark, Luke and John. Open the Bible to Luke. Each book is numbered by chapter and verse. The BIG numbers are the chapters. They are the first number in the citation. The small numbers are the verses. They are the second number in a citation. If a verse reads Luke 2:41, you look in the book of Luke, chapter 2 and verse 41. Let’s find it. It is about when Jesus was almost a teenager – he was twelve years old. It goes from verse 41, all the way to verse 52. We’ll read it through, and then you will act it out. Act out the story, using the Biblical characters (Jesus, his parents, the elders, other members of his family, other people at the temple, etc. ), and "Morris". May act story out from Bible reading, imagination, or from the included skit, depending on your own comfort level and choice. 1. How do you think Jesus was like all the other kids his age? 2. How do you think Jesus was different from the other kids? 3. How does being a Christian make us different from other people? 4. What does it look like, living the way God wants us to? Concept to focus on: because as Christians we believe that Jesus came to be our teacher and our savior, we believe that Jesus is our example for how to live our lives. This is what makes us different from other people who do not believe in God and in Jesus. We make every attempt to listen for God’s guidance in our lives, to follow Jesus’ example, and to do God’s will. Dear God, we thank you for your presence in our lives. Please guide us to know what you want us to do. Thank you for loving us just the way we are. Amen. lunch. Have you seen Jesus? MARY --- You know, I haven't seen him since we left Jerusalem. MARY --- Joseph, I'm worried. Let's go back and get him. MARY --- Jerusalem is a big city. Where will we look? Daniel prophesied that the messiah of God would triumphantly ride into Jerusalem in 69 sevens of years from the time of the proclamation to rebuild Jerusalem. According to my calculations, that means that the Messiah will come to earth in just 18 years. MORRIS - Buzz off kid, I'm expounding here. Messiah will ride triumphantly into Jerusalem in 18 years. (patronizingly) When you grow up maybe you’ll be able to read all about it. Until then, you’ll just have to take my word for it. years on the first day of the feast of unleavened bread. don't you just go outside and play. JESUS -- Well, what I wanted to explain is that the Messiah is already on earth. unleavened bread in 18 years. That’s true. But he was born twelve years ago. JESUS -- Then, how do you explain what the prophet Isaiah said? government will be on His shoulders. And He will be called Wonderful, Counselor, Mighty God, Everlasting Father, Prince of Peace. MORRIS - Alright, so it looks like the messiah is born as a baby. So? men in my family are priests. when he rides into town in 18 years, then he has to be alive already. JESUS -- Yes, he is one of us here. MORRIS – (puffs up and looks important) Well then! Maybe it's me! JESUS -- No, it's not you. would be a better Messiah than me? from the line of David, not from Aaron. JESUS -- Are you from the line of David? MORRIS - (digs toe into dirt) ...ummmm...errrr… well….. not exactly…..
JESUS -- The Messiah was born in the city of David as Isaiah predicted. MORRIS - How do you know? JESUS -- The Messiah was BORN in the city of David. Seymour was born in Jericho. JOSEPH --- (enters – speaks with great relief) There he is! MARY - (enters) Jesus, we were worried about you! JOSEPH - We were half way home when we noticed that you weren't with our group. MARY --- What were you doing here? JESUS – Why did you worry? Didn’t you know that I would be here in my Father’s house? JOSEPH--- Well anyway, we’re glad we found you and you’re safe. We’ll have to hurry to catch up with our group again. Let’s go. Discuss children’s favorite songs, and discover that people in Jesus’ time enjoyed music as much as we do. Older Children – Listen to a Hebrew song praising God, then a prayer rap/song telling Jesus’ life story. Children then work together to write a rap song praising God and/or telling about Jesus’ life. Younger Children – Listen to Hebrew music while creating musical instruments, then use the instruments in a movement activity involving one or more Hebrew songs. Materials to make simple musical instruments – ie. coffee cans, oatmeal boxes, paper plates, beans, etc. Opening Prayer: Dear God, Thank you for this time together today. We want to praise you today! Please hear the words of our mouths and know that our hearts are reaching for you through our work together here today. Amen. Discuss with the children their favorite songs and musicians. Discuss music in Biblical times, including whatever information from below seems appropriate for the group of children you have. Jubal was the inventor of musical instruments (Gen. 4:21). The Hebrews were much given to the cultivation of music. Their whole history and literature afford abundant evidence of this. After the Deluge, the first mention of music is in the account of Laban’s interview with Jacob (Gen. 31:27). After their triumphal passage of the Red Sea, Moses and the children of Israel sang their song of deliverance (Ex. 15). But the period of Samuel, David, and Solomon was the golden age of Hebrew music, as it was of Hebrew poetry. Music was now for the first time systematically cultivated. It was an essential part of training in the schools of the prophets (1 Sam. 10:5; 19:19-24; 2 Kings 3:15; 1 Chr. 25:6). There now arose also a class of professional singers (2 Sam. 19:35; Eccl. 2:8). The temple, however, was the great school of music. In the conducting of its services large bands of trained singers and players on instruments were constantly employed (2 Sam. 6:5; 1 Chr. 15; 16; 23:5; 25:1-6). At the closing, teach the children to sing “Shalom Chaverim” a Hebrew goodbye song. The following drama script was posted for use with CreativeCarol's Art/Drama "Greek Mask, Greek Drama" lesson posted in the art workshop thread in this forum. It can also be used with any lesson. The story of Jesus remaining behind in Jerusalem while his parents headed back home after the Passover is acted out by the children, in several stages, with the help of adults who guide them through their parts and lead a discussion of the story between each stage. One or more adult leaders to guide the children through the script and lead the discussions. The script includes the voice of a narrator, who could be the discussion leader or another adult. It can certainly be useful to have a different adult to prompt the children. The script below has speaking parts for six children, some of which are simple enough to be spoken from memory (or from an adult prompt) by children who are too young to read. Adults could take the place of children if you don't have six in church. If you have more children then all of them can participate in the play by being part of the crowd with Mary and Joseph, or by being teachers in the Temple. Six copies of the play script, with a speaking part highlighted on each. The discussion leader, narrator and prompter will also need scripts. One sign that says 'Nazareth' and another that says 'Jerusalem'. Any costumes or accessories that you think appropriate. They aren't necessary, but the children do often enjoy dressing up. Fix the 'Nazareth' sign to one end of the church and the 'Jerusalem' sign to the other. You might use the central aisle as the road between the two: Mary and Joseph and the rest of the crowd could then rest in the nave on the way back to Jerusalem, where they realise that Jesus was missing. These teaching notes are intended to be used in between the scenes in the drama. Jesus lived with his family in Nazareth - about 80 miles from Jerusalem - or about 3 days' travel. They made this journey once a year, for the Passover festival in March or April. The festival lasted for eight days. They would have travelled in a large group of friends and relatives. There are four gospels. Luke alone tells us this much about Jesus' childhood. It reminds us that he knows what it is like to be a child, to grow and to learn. In those days, twelve was just about the end of childhood. At that age boys would have begun to learn a trade. More like today's sixth formers? In such a crowd of fellow-travellers it would have been easy to lose track of Jesus, each assuming he was with the other or with some other relative or friend. How would they have felt when they stopped for the night and discovered that he had been left behind? Terrified? Guilty? For three days - while his parents travelled away from Jerusalem, then back again, then searched for him - Jesus had been discussing God's word and astonishing those who heard him with his understanding and answers. When we think about the impressive intellectual insights and research of Jewish Rabbis, this is like a Year 7 discussing physics with Einstein! Has Jesus been thoughtless? Naughty? Many a parent must have read this story in the Bible and asked these questions! But, no: at the age of twelve he is growing in independence and beginning to understand who he is and what his mission must be. Just like other boys his age, Jesus is beginning to learn his father's business - but he is telling Mary and Joseph that his first priority must be his Heavenly Father and His business. He has stayed behind in the Temple to learn more about God and his plans; to let his parents know that he is becoming a man who must fulfil God's plans for him; to begin to tell people about God as our Heavenly Father, and himself as having divine wisdom. When Jesus calls God his father, Mary and Joseph do not really understand what he is telling them. They know that he is the Messiah, the one who will save the Jewish people, but they don't yet understand how he will save them; that he is also God's son. Jesus was fully obedient to his earthly parents. We know that he did learn his father's trade and became a carpenter. He did not insist, as such a clever child might, on staying in Jerusalem and learning from all the best teachers. He was obedient to God's will for him, and he had the patience to await God's timing for his ministry to begin. We don't know anything about the next eighteen years, but we can have faith that God's timing was perfect. God has plans for us all. We may not understand them yet. We may feel impatient to know what will happen next, and for it to come sooner. We may feel afraid. But we can trust Jesus to be with us and we must follow his example: seeking to learn more about God; being obedient to those to whom he has entrusted us; waiting to find out his plans for us; growing in independence and having the courage to do his will when the time comes. Jesus, Mary, Joseph are in Nazareth. A crowd of friends and relatives are also in Nazareth, but standing slightly apart from the holy family. Narrator: The child grew up and became strong and full of wisdom. And God's blessing was upon him. Every year at the Passover festival, Jesus' parents used to go to Jerusalem. When he was twelve years old they went up to the city as usual for the festival. Joseph: It's time to go to Jerusalem for the Passover. Come on, everyone. A crowd joins the holy family. They all walk from Nazareth to Jerusalem. STOP THE CHILDREN WHEN THEY REACH JERUSALEM AND ASK THEM TO TURN TO FACE YOU, TO LISTEN TO THE TEACHING - SEE NOTE 1. Narrator: When it was over they started back home, but the boy Jesus stayed behind in Jerusalem, without his parents' knowledge. Person 1: The Passover is over now. It's time to go back home to Nazareth. Everyone except Jesus walks back to the middle of the aisle, where they stop. Jesus remains with the Temple teachers. Narrator: They went a day's journey assuming that he was somewhere in their company, and then they began to look for him among their relations and acquaintances. Mary and Joseph start to look for Jesus. Mary: Have you seen Jesus? Narrator: They failed to find him, however, and turned back to the city, looking for him as they went. Mary and Joseph walk back to Jerusalem. STOP THE CHILDREN WHEN MARY AND JOSEPH REACH JERUSALEM AND ASK THEM ALL TO TURN TO FACE YOU, TO LISTEN TO THE TEACHING. SEE NOTE 2. Narrator: Three days later, they found him - in the Temple, sitting among the teachers, listening to them and asking them questions. All those who heard him were astonished at his powers of comprehension and at the answers that he gave. When Joseph and Mary saw him, they could hardly believe their eyes, and his mother said to him, Mary: Why have you treated us like this, my son? Here have your father and I been worried, looking for you everywhere! Jesus: But why were you looking for me? Did you not know that I must be in my Father's house? Narrator: But they did not understand his reply. REMIND THE CHILDREN TO FACE YOU TO LISTEN TO THE TEACHING. SEE NOTE 3. Narrator: Then he went home with them to Nazareth and was obedient to them. Joseph: It's time for you to come back home with us now, Jesus. They walk back to join the crowd. Person 3: Hurray! They found Jesus! All except the Temple teachers walk back to Nazareth. Narrator: And his mother treasured all these things in her heart. And as Jesus continued to grow in body and mind, he grew also in the love of God and of those who knew him. JLangloisFriend of WoRMy (15+ pts) a Supporting Member! We have been appreciating the wealth of information found on this website. We are modifying material for 2nd - 5th graders for children's church in a non-rotational setting. I recently reached out to a couple of inter-faith families to ask for their help in teaching Hava Nagila, the hora, and/or the dreidel game as a culminating activity to this "unit". Interestingly, they had a different reaction than I foresaw. In the Jewish tradition, age 12 is the time a young person prepares for his Bar Mitzvah or her Bat Mitzvah. This is an important time of study. While our intent was to share what else Jesus could have been doing (because a lot happens in a church all week long), that message did not translate initially. It appeared that we were missing the intensity of a young person's commitment to this meaningful and momentous rite. We have clarified our intent, and our understanding has increased, but I write in hopes of raising awareness in case we can save similar confusion for others. It is our shared hope, I know, to be inclusive and to celebrate all. Again, thank you for the support!